Ready to try some delicious French candy? There is something here to please everyone for the French love candy. They eat several kilograms of bonbons (literally good goods) per year per citizen, and I know my family makes a significant contribution to this consumption. Here are some of our favorite French candies. These are made only by one company (run by the Troubat family) located in Flavigny-sur-Ozerain in the Burgundy region of France. These hard candies are made by patiently covering an anise seed, layer by layer, with sugar syrup, resulting in a satiny smooth delicacy. They come in several different flavors including anise, licorice, mint, rose and orange. Troubat markets their traditional anise drops in charming tin boxes, each with a scene from French country life printed on top -- collectors items in themselves. Here's a French candy invented by a pharmacist working in Toulouse in the late 1800's. The success of Le Cachou is attributed as much to their innovative packaging as to their taste. Leon Lajaunie had the brilliant idea of marketing his licorice drops in a special little yellow box that one could easily slip into ones pocket. These little yellow boxes persist to this day and more than 10 million of them are sold each year. Ready to try? A berlingot has an unusual four pointed shape called a tetrahedron, that invites you to turn the hard candy around and around in your mouth, and of course dip your hand in the bag for another when the first has melted away. 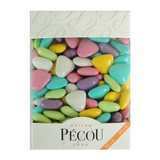 This French candy comes in a fabulous array of colors and flavors going far beyond the classic lemon, mint and orange. You can even find tea, cactus, bamboo and lotus flavored berlingots! If you visit the city of Nantes in the north west of France close to the Atlantic seaboard, you will most likely encounter a berlingot for it is a speciality of the region. The city of Carpentras also has its own striped version of a berlingot, and in fine French fashion the two cities dispute the honor of having first invented their treasured bonbon. Calissons are an elaborate almond shaped French candy that originated in Aix-en-Provence in the south of France more than 500 years ago. The specific details of its origin are subject to much debate, and exactly how they are made can still be a closely guarded company secret. Which is to say they are another fine example of a French speciality. They are made from ground almonds mixed with candied melon and perhaps some orange to form a jelly candy that is then covered with shiny white royal icing. It is an elaborate process to make a calisson which helps to explain it's fairly high price. They usually come in an elegant box and are meant to be slowly savored, appreciating both their flavor and their beauty. French dragees are almonds that are covered with an especially hard and shiny coating. You may know these as Jordan almonds, and they have been a part of French celebrations for many centuries. The French city of Verdum is famous for its production and you can learn more about them here: French Dragees. Haribo makes a chocolate covered marshmallow bear that has garnered particular favor in France (I've even seen a recipe using these), as well as Gummi Bears, known the world over. Maybe you prefer something a little more subtle and unusual though. If that's the case, lavender candy may just be the answer. The French like to use flowers as flavorings in sweets and lavender is a favorite. A good lavender hard candy is made with the essential oil of the plant and no artificial flavors. To be sucked on slowly - perhaps on a rainy afternoon with a good book. 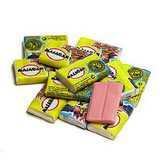 This is a brand of bubble gum first created by the French company Krema in 1957. Immensely popular with French school children, this pink chewing gum is sold in small rectangles that are easily split in two for sharing with a friend. You can buy a whole package of these, but I think most of it is sold piece by piece, frequently at the local boulangerie. It comes wrapped in a piece of waxed paper that sometimes features a tattoo, sometimes a cartoon, sometimes a riddle. The kids like to collect the different series of wrappers. In France, nougat is made from almonds, pistachios, honey and egg whites. It is soft, chewy and rich with nutty flavor. And it's sticky and yummy. 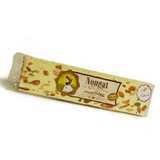 French nougat candy has its origins in the Orient many thousands of years ago when honey and nuts were first combined. France has been making its own version for many hundreds of years. In the 17th century, near Montelimar in the south of France, Olivier de Serres began growing almond trees and using the nuts along with honey to make his nougat. Over the years, the recipe for the candy changed to include egg whites which makes a more airy and light candy. These days the Nougat de Montelimar is sanctioned by an AOC (Appellation d'Origine Controlée) -- a product that marks itself with the appellation must contain a minimum of 30 percent almonds (or 28 percent almonds and 2 percent pistachios) and 25 percent honey. You'll find this French candy featured as one of the thirteen desserts at Christmas eve celebrations in Provence, but you don't have to wait until December to try a bite of sunny southern France. Vichy pastilles were first developed by a pharmacist in the early 1800's who wanted to incorporate the digestive enhancing qualities of the famous Vichy water in a pill form. Originally the pastilles contained only sodium bicarbonate, but these days they are made from the minerals that remain when Vichy water is evaporated, along with sugar and some flavorings. The classic Pastille de Vichy is mint flavored, but you can also enjoy them in lemon and anise. Vichy pastilles are not too sweet with a slight salty taste (that's those healthy digestive minerals) that melts slowly in your mouth. 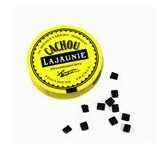 They freshen the breath and are said to help digest, making this French candy especially popular during copious meals. The perfect accompaniment to your next ten course French feast! Go from French candy to French Foods.